Dr. L. D. C. Peiris is Senior Lecture at the Department of Zoology, University of Sri Jayewardenepura. She obtained B.Sc. (Colombo), Ph.D (UK). 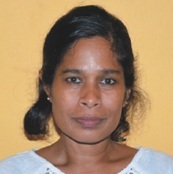 Her research interests are in Environmental physiology Bio chemistry cancer research, Environmental Science.